The tank, screen and beak on my V2 has been covered in Plasti dip since the first week I purchased it, I wanted to protect the paint. - Taking off the upper screen and only using the lower screen makes the turbulent air hit me right in the visor, it's lower than the stock screen but still too high to leave my head in clean air. - I'm a bit concerned about the warning to not use it above 80mph. I didn't get the 1000cc engine to go 55! In central Texas there are highways with limits as high as 85. I do feel a lot more drag at upper highway speeds, especially with the windshield extended. The airflow never worked for me on my 650 so I didn't bother trying it again on the 1k. It felt like a big hand pushing on my back. I've concluded that windscreens are very personal and require a lot of trial and error. Having said that, the mra x-screen has been effective on my last 3 bikes. I just keep moving it over lol. What warning? 80 mph hah! I've pushed 100 and the Givi was solid. I don't keep it all the way extended so maybe that's what the warning is for don't know. 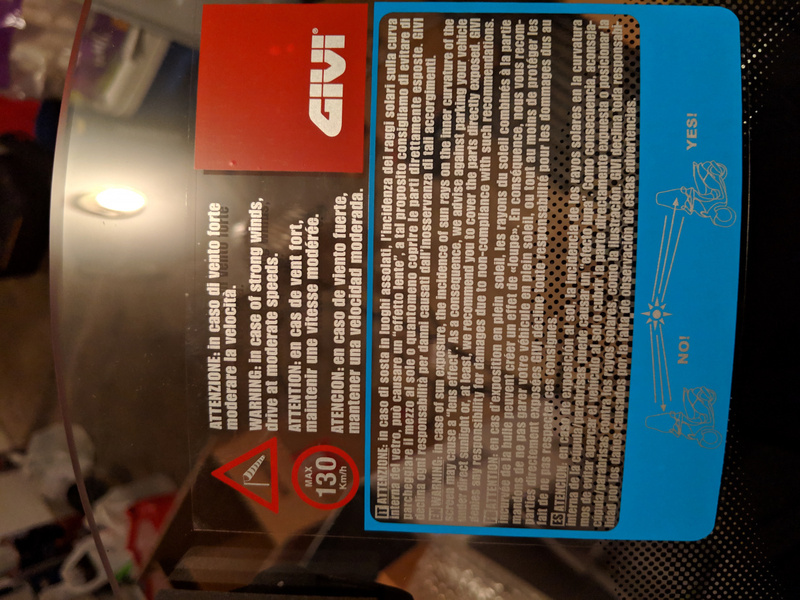 Here's a picture of the sticker that was on the windshield, it also has the sun exposure warning that's been discussed in this thread. Now you tell me about speed limit ???????? Well after two bikes (both DL1000, 2014 and 2018), both with Givi Airflow and both ridden many times on their top speed (close to 125 mph), I can confirm that the speed limit sticker is piece of crap. If you're worried about it, just remove the top portion if you want to ride it over that "speed limit" sticker. I think the airflow is pretty stout. That rating is also probably worst case, with a little safety factor. I had the shield on my bike for a week and stupidly dropped my bike in the garage. The screen took the brunt of it and all is good. Installed airflow on my L4 and SFSG. Still needs a real ride to fine tune position. Rain and flu has kept me sidelined.